Dear Friends, sister, brothers – officers and members of the Indonesian Association of Families of the Disappeared (IKOHI), as you celebrate the 10th anniversary of your organization today, we bow our heads, send you our warmest greetings and once again renew our strong unity with you in our shared struggle and vision for "a world without desaparecidos." Your theme for the day, "A Decade of Victims' Struggle for Truth and Justice" is most fitting. It is also now 10 long years since we forged our collective strength and started marching together gradually but surely towards the achievement of our shared dreams and aspirations. 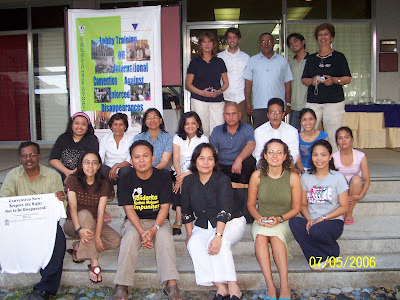 As we look back, the road was not easy – sometimes, this was thorny and bumpy, we met trials, difficulties and pains including that of losing some of our beloved co-workers like Munir and Aasia – who are now among the many Asian human rights defenders who became victims themselves. Yet, they were not silenced by the powers-that-be despite their physical deaths because we who are left behind remain firm and steadfast in pursuing the cause they have died for. We keep on with the long, long journey towards the achievement of justice for our disappeared loved ones and for all desaparecidos all over the world. Today as in many other important dates we share, let us further strengthen our unity and continue to work together so that in giving our share towards the resolution of enforced disappearance cases, our children and our children's children will not anymore suffer the same fate suffered by our beloved desaparecidos who are now physically gone but are immortalized in our minds and hearts. Our work may not be easy as we experienced so often in the past. But especially during the most trying times, let us always remember that we are not alone, that we have collectively evolved an Asia-wide federation for the disappeared and their families, one that has always maintained strong ties with the international movement for the desaparecidos and their families. It is from our strong regional and global unity that we will always derive the much-needed strength and inspiration to go on and it is from this same vein that we assure you our loving presence. The organizing of families of the disappeared, which is the central task of IKOHI is a recognition of the principal role of the families in bringing to a triumphant end the years of struggle towards a world without desaparecidos. We wish you more fruitful years to come! More power to all of you! Long live IKOHI!